In my totally biased experience, there are two cake types that literally EVERYBODY likes. One is chocolate cake and the other one is lemon cake. 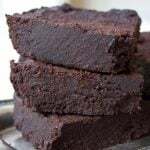 It’s chocolate when you’re after something rich, sumptuous and indulgent, such as this Keto chocolate cake. And it’s lemon when you’re looking for a refreshing yet subtly sweet experience, to cleanse your palate in a most agreeable way. 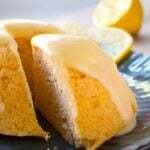 I’m a big fan of lemon in desserts and have posted an amazing low carb lemon cheesecake and this really popular sugar free lemon mug cake on the blog already. In terms of taste, Keto lemon bars sit somewhere in the middle between the two. 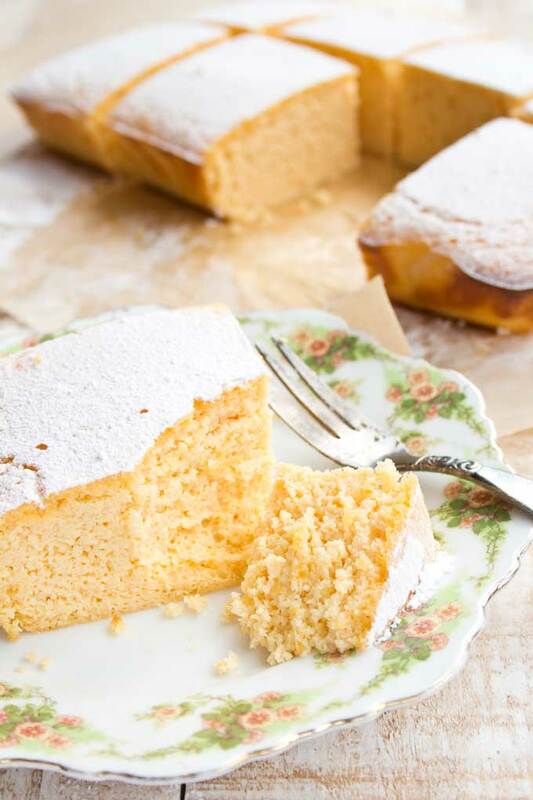 It uses almond flour just like the sugar free lemon cake recipe. But due to the addition of sour cream it’s even more moist – I find there’s a hint of baked cheesecake texture. Trust me, it’s a truly delicious dessert experience. 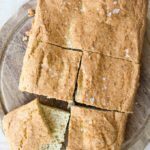 I’ve used ground almonds for this cake, which is equivalent to coarse/grainy almond flour or almond meal, which helps with creating that super juicy sponge cake we’re after. 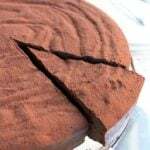 If you want to make this cake with super fine almond flour, you’d probably have to reduce the amount of almond flour by about 1/4 cup to get the same result. 1.) Beat the eggs until frothy. Then add the softened butter and the sour cream (could be replaced with cream cheese) and blend in a food processor or with an electric mixer until combined. 2.) Add the lemon juice, lemon zest and powdered sweetener. Definitely, definitely do not miss out the lemon zest. It lends amazing flavour. Make sure you buy unwaxed lemons so you’re not grating any chemicals into your cake! 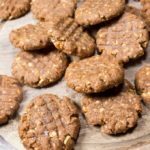 I chose powdered erythritol for this recipe, but a brown sugar substitute would also work well here. 3.) Last, add the ground almonds / coarse almond flour and the baking powder. Mix until smooth and let the batter sit for a couple of minutes so it thickens. The batter should be thick but pourable. 4.) Line a small casserole dish with parchment paper. I used a 9 x6 inch dish, but it could even be slightly bigger – my cake bar slices were a generous 4 cm / 1.5 inch tall. Fill in the batter and bake on the middle oven shelf for 35-40 minutes. If you prefer, you can bake this cake in a loaf tin. I have a silicone pan like this, which is also great for bread. 5.) And voila, here’s the finished cake. Doesn’t this colour lighten your mood immediately?!! 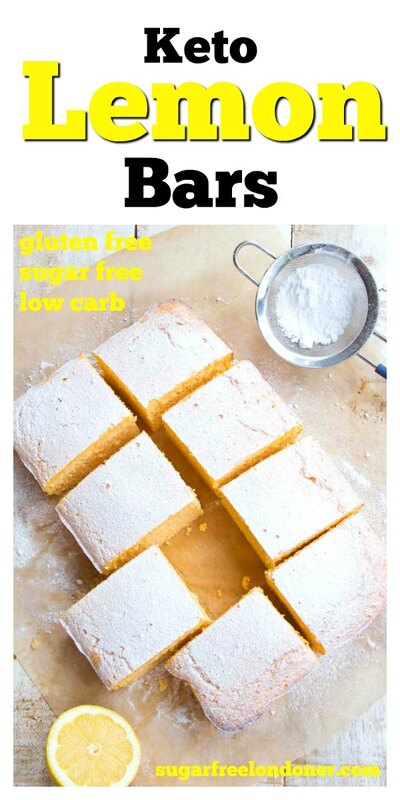 If you wanted, you could enjoy your lemon bars “naked” and be perfectly happy. The topping is entirely optional, but I agree that it does add to the wow factor. I decided to keep it quick and simple and dusted powdered erythritol over the cake. Mix 4 tbsp lemon juice with 4 tbsp powdered sweetener and drizzle over the cake. 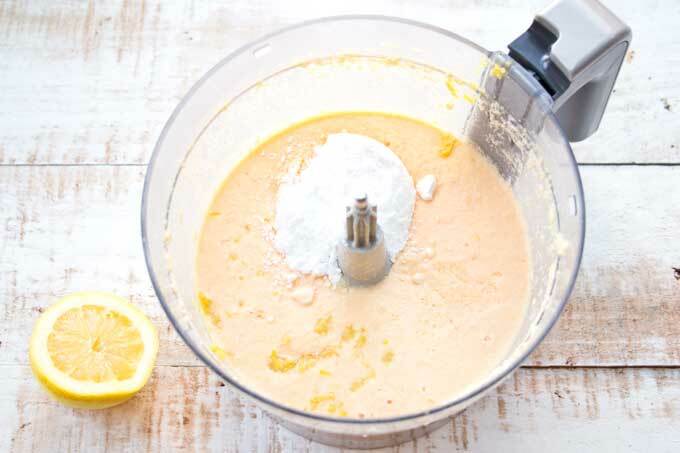 Stir together 4 tbsp melted butter, 4 tbsp double cream, 4 tbsp powdered sweetener and the juice of 1 lemon. Wait until the mixture starts to cool and thicken, then pour over the cake. 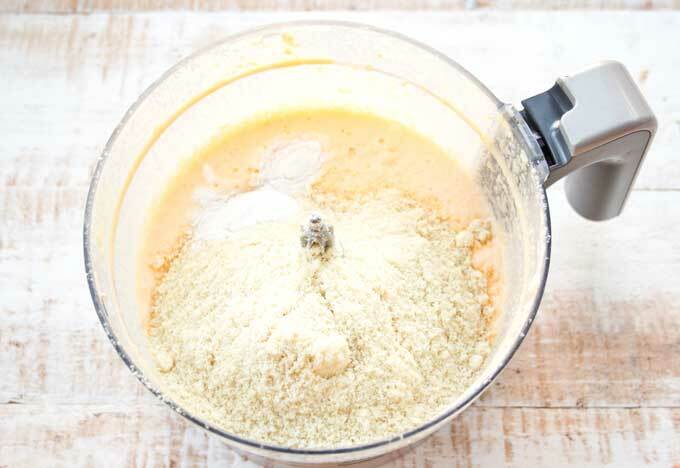 Mix 1/2 cup cream cheese, 4 tbsp powdered sweetener, squeeze of lemon juice and grated lemon zest. Spread over the lemon bars and grate some extra lemon zest on top. Melt 1/2 cup butter (4 oz / 120g) in a saucepan. Take off the heat and add 1/2 cup (120 ml) lemon juice and zest of 1 lemon, 6 egg yolks and 3/4 cup (80g) powdered erythritol. Put back on a low heat. Whisk continuously until the mixture starts to thicken. Cool in the fridge. Whip 1 cup / 240ml of double cream until stiff and fold in the cold lemon curd. Spread over cake and grate more lemon zest on top. I know some of you cannot have almond flour. 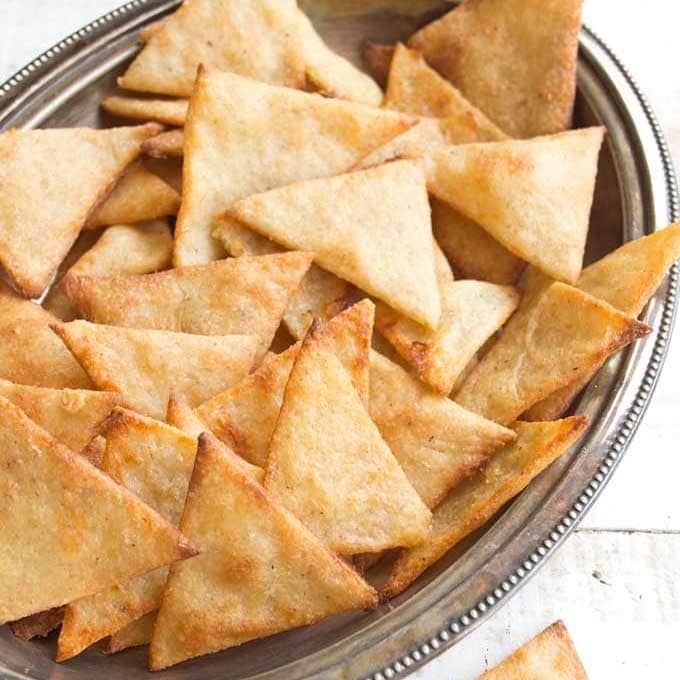 You can try making this recipe using 1 cup of coconut flour in place of the almond flour. Coconut flour absorbs more liquid than almond flour, that’s why you’ll need only half the amount. I have not tried making this particular cake with coconut flour myself, but it’s the substitution amount I’d go for. If you substitute, you MAY also ned to add 1 additional egg (coconut flour goods tend to be more delicate). If you have xanthan gum, add 1/2 tsp. Xanthan gives a better crumb structure, but it’s not essential here. Easy-peasy, gently sweet and super refreshing! 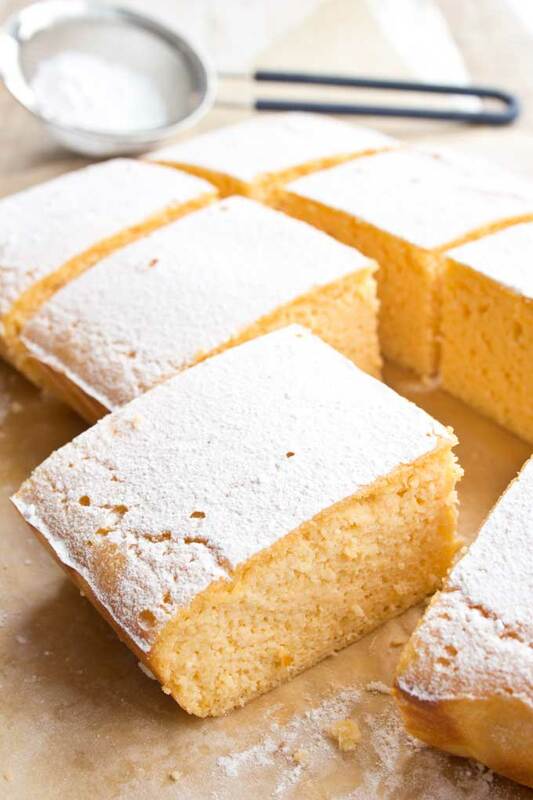 These moist Keto lemon bars will blow you away. 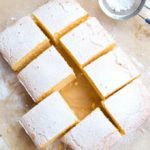 Check out the post for lots of topping ideas and variations, from sugar free lemon drizzle to low carb lemon curd frosting. 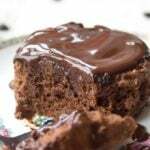 2 cup / 200g almond flour or ground almonds / NOT super-fine almond flour!!!! Beat the eggs until frothy. 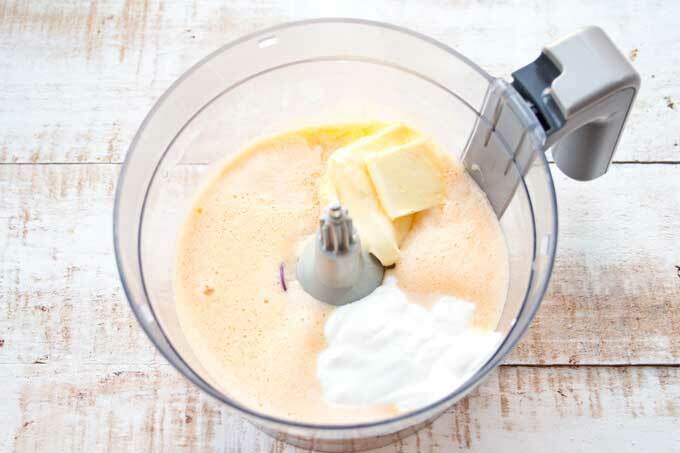 Add the sour cream and softened butter and blend with a food processor or electric mixer until combined. Add 1/4 cup (4 tbsp) of lemon juice, the grated zest of 1 lemon and 1/3 cup powdered erythritol. Blend. 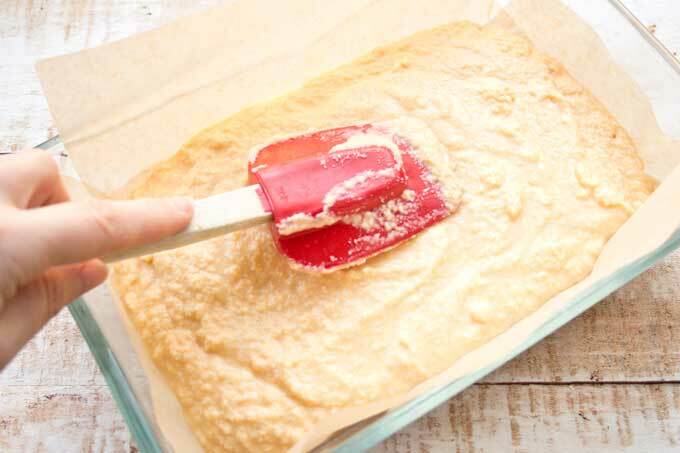 Lastly, add the almond flour and baking powder and mix until you have a smooth batter. Line a 9x6 inch casserole dish / baking pan with parchment paper and fill in the dough. Bake in the middles shelf of the oven for 35-40 minutes until the top is lightly browned and a skewer inserted comes out clean. Leave to cool completely before cutting or removing from the pan. 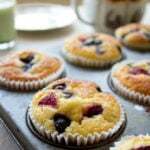 Almond flour cakes are fragile when hot, but they firm up as they cool down. 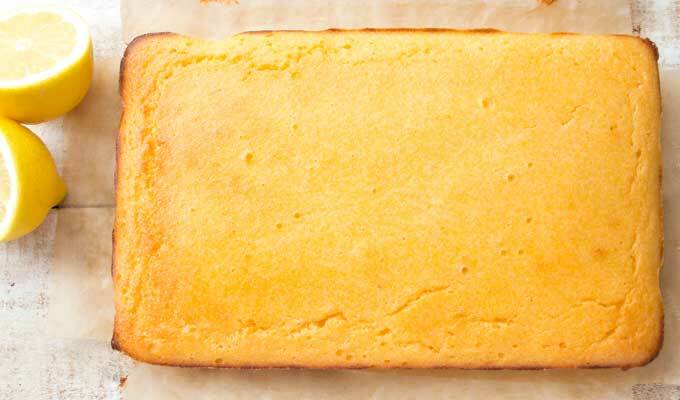 This lemon cake recipe works best with coarse /grainy almond flour (ground almonds in the UK). The cake is only gently sweet. Please taste and increase sweetener to your liking if necessary. For me, 1 1/2 lemons yielded 1/4 cup lemon juice. For extra zing, you could increase the amount of lemon juice by up to 2 additional tbsp. 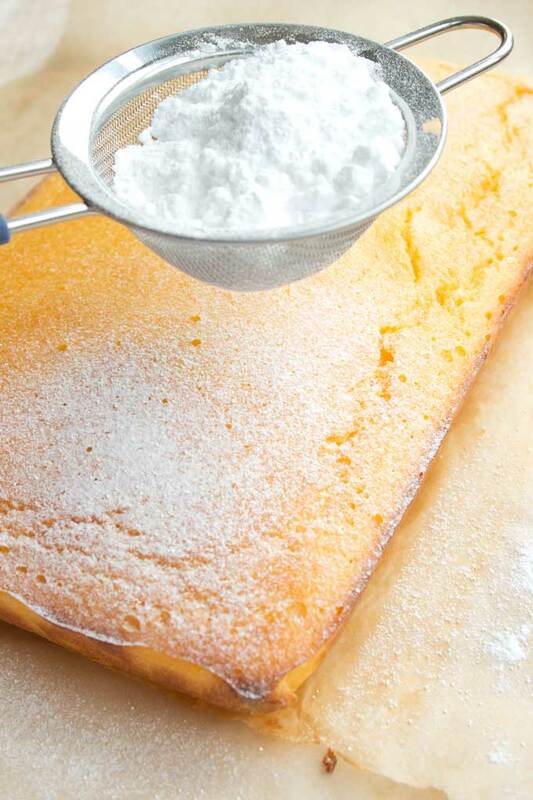 Wait until the cake is COMPLETELY cooled before dusting with powdered sweetener. If it's still warm, the erythritol melts into an unsightly sludge. Please see the post for topping ideas, from sugar free lemon drizzle to lemon frosting. This post contains affiliate links. If you click on one of these links, I may earn a small commission – at no extra cost to you – which helps me with the running costs of the site. Thank you for supporting Sugar Free Londoner. Got this in the oven right now! So can’t wait to have it tonight! Again a wonderful recipe that is easy to put together, easily accessible ingredients and lemony! What’s not to love??!!!! Hope you liked it Kate!!! Hi Amy, I would use coconut cream or a good quality coconut yoghurt. I only have the super fine almond flour. Will it work with this recipe? Thanks! Hi Danielle, you may need to use a bit less almond flour if yours is super fine. Try 1/3 cup or 1/4 cup less and see if the texture is good. Yum!!! Glad it was a success! What an amazing recipe! Made it last night, trying not to eat the whole thing in record time! Haha, that’s the only problem with it! If we can’t get coconut flour, can I use almond flour. Hi Nicole, the recipe actually uses almond flour. 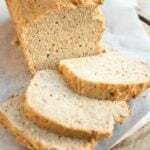 If you want to use coconut flour instead, simply halve the amount stated for almond flour. This is delicious! Have never had lemon cake before but I love this! Just the right amount of lemony flavour and sweetness… My husband has to use his will power to stop at one. This will be a permanent fixture in our house, just like your cinnamon scrolls! Yum! Hi! Made this last night with coconut flour, the extra egg you suggested as well as xanthan gum. Turned out great, thanks! It’s the perfect snack for when you’re travelling (no toppings then). 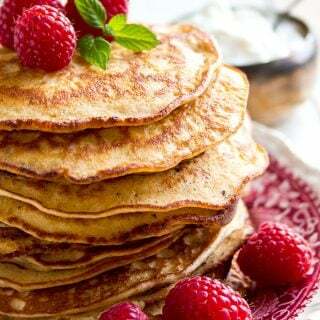 Hi Danielle, You can try making this recipe using 1 cup of coconut flour in place of the almond flour. Coconut flour absorbs more liquid than almond flour, that’s why you’ll need only half the amount. I have not tried making this particular cake with coconut flour myself, but it’s the substitution amount I’d go for. If you substitute, you MAY also ned to add 1 additional egg (coconut flour goods tend to be more delicate). If you have xanthan gum, add 1/2 tsp. Xanthan gives a better crumb structure, but it’s not essential here. What’s a “serving”???? The nutrition facts are “per serving “ but NOWHERE does it state what a serving is!!!!!! 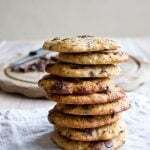 Hi there, I’m sorry this was not clear – I always state the amount of servings in the recipe card. I cut my cake into 8 generously-sliced bars. One bar is 1 serving.